3.Sift the cake flour, sugar, baking powder and salt into a large bowl. Make a well in the center and add the oil, egg yolks, water, peppermint extract and vanilla extract. Beat with mixer on low for 1 minute. 4.Beat egg whites with cream of tarter until stiff peaks form. Gently fold the whites into the yolk mixture. Pour 1/3 of the batter into a separate bowl and tint with the food coloring. 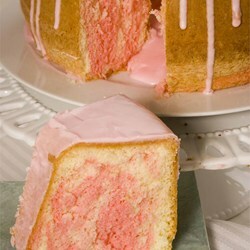 5.Alternate large spoonfuls of red and plain batter into an ungreased tube or bundt pan. Run a knife or spatula through the batter to make a swirled effect. 6.Bake at 325 degrees F (165 degrees C) for 55 minutes. Increase heat to 350 degrees F (175 degrees C) and bake for an additional 15 minutes or until done. Let cake cool in pan on rack. Once cool remove from pan and frost, if desired. Feb25February 25, 2015 • By Bob • This entry was posted in Holiday Desserts, Holiday Recipes and tagged Holiday Cake. Bookmark the permalink.